Treasure Cove II Inc. is a manufacturer of quality architectural precast concrete products, located in Sarasota Florida. We are known for our unique pieces that are used by architects, designers, builders and developers. 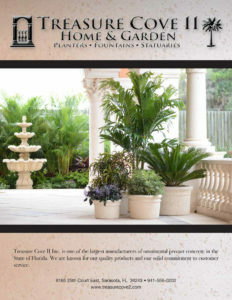 Our product line includes: Modern, Spanish, Traditional, Mediterranean and Florida Outdoor Living. If you’re looking for a distinctive piece that will set your design apart from others, stop by or give us a call at one of our 3 locations. Treasure Cove II Inc. located in South Sarasota, off US 41 offers pots, planters, plants, lawn decor and outdoor living accessories. Treasure Cove II Inc., located off US 301 in North Sarasota can help you with all your precast, ornamental concrete needs. We offer the finest selection available. Treasure Cove, for The VeryThing.offering the area's finest selection of Gifts, Outdoor Accessories, Fountains, Planters, Statuary, Coastal Decor and more.